as important as the main meal is on christmas, equally important (in my humble opinion) is an appetizer or two to get you started off on the right note. 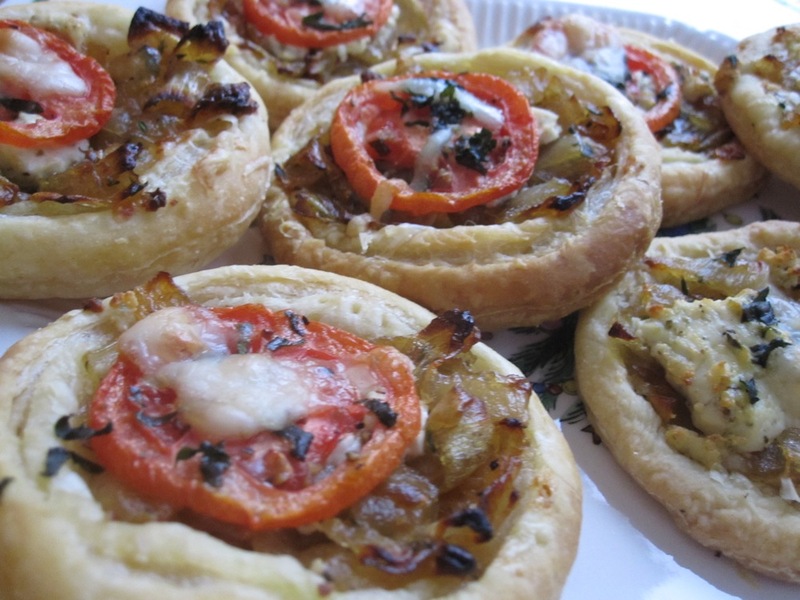 i have made + sampled many appetizers + still am wowed by these delicious tomato + goat cheese tarts. they are savory + rich without being overwhelming, + by converting them to mini-tarts, they don’t fill you up too much before dinner. additionally, they are relatively quick, easy, + inexpensive to make. a few notes – splurge + buy a really tasty goat cheese. that’s the star of this, so it’s worth it. i usually omit the tomato on a few tarts, as some people are not huge fans of tomato. in the past, i’ve done variations, too – instead of onions/garlic on all of them, i sauteed cremini mushrooms with shallots + balsamic vinegar + made that the topping on some, which was a huge hit. next time you’re looking for an appetizer to bring to a dinner party, try these! unfold a sheet of puff pastry on a lightly floured surface + roll it lightly to an 11 x 11” square. using a 6-inch wide saucer (for large tarts) or pint-size glass (for mini-tarts) as a guide, cut circles from the sheet of puff pastry, discarding scraps. repeat with the second pastry sheet (will make 4 circles for large tarts, 24 for mini tarts). place the pastry circles on 2 baking sheets lined with parchment paper + refrigerate until ready to use. heat 3 tablespoons of olive oil in a large skillet over medium to low heat + add the onions + garlic. saute for 15 – 20 minutes, stirring frequently, until the onions are limp + there is almost no moisture remaining in the skillet. add 1/2 teaspoon salt, 1/4 teaspoon pepper, the wine, + thyme + continue to cook for another 10 minutes, until the onions are lightly browned. remove from the heat. using a sharp paring knife, score a 1/4” wide border around each large pastry circle (or a slightly smaller border for mini tarts). prick the pastry inside the score lines with the tines of a fork + sprinkle a tablespoon of grated parmesan (less for mini-tarts) on each round, staying inside the scored border. place 1/4 of the onion mixture (or less for mini tarts) on each circle, again staying within the scored border. crumble 1 ounce of goat cheese (less for mini tarts) on top of the onions. place a slice of tomato in the center of each tart. brush the tomato lightly with olive oil + sprinkle with basil, salt, + pepper. finally, scatter a couple parmesan peelings on each tart. bake for 20 – 25 minutes, until the pastry is golden brown. the bottom baking sheet may need an extra few minutes in the oven. serve hot or warm. speaking of light but tasty goat cheese apps…. for thanksgiving and xmas i made these and they were a huge it — roll a dallop of goat cheese, currants, and a bunch of raw arugula in proscuitto. delish. its like a salad in a bite. the goat cheese/arugula/prosciutto rollups sound great! i’ll definitely try them, as i love everything in there. another similar recipe is goat cheese stuffed figs or dates, either as is, or wrapped in bacon/prosciutto + broiled. i’m actually going to eat some goat cheese + crackers right now – all this talk has made me hungry for some!